Let Us Personalize Your Wine & Book Your Vacation! Genevieve Wine & Travel offers premium wines and great travel deals. Are you planning a vacation anytime this year? Let us help you with booking your hotels and tours. We have an abundance of getaway deals for travel worldwide! Whether you’re traveling domestically — Florida, Hawaii, Nevada, New York– or Internationally – France, China, New Zealand — We can help you to plan your travels. 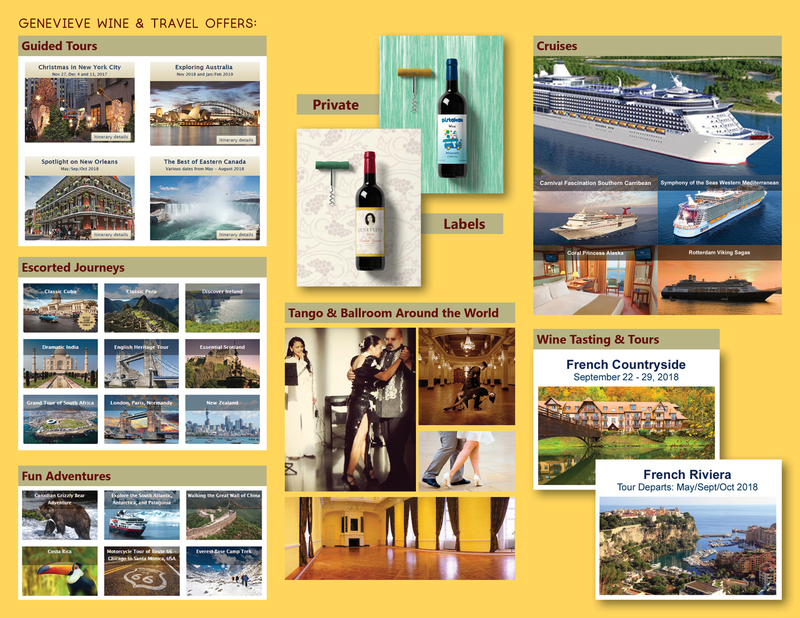 Genevieve Wine & Travel also offers tours, cruises, wine tasting, and Tango & Ballroom dance events. All events are on a First Come, First Serve basis. For more information or travel booking, please send us an email to info@genevievewine.com.